Art Forces, founded in 2001, has completed more than 50 public art projects in the US, Palestine and Lebanon.Art Forces uses community public art and technology, including murals, websites, social and new media, to inspire critical thinking and action. 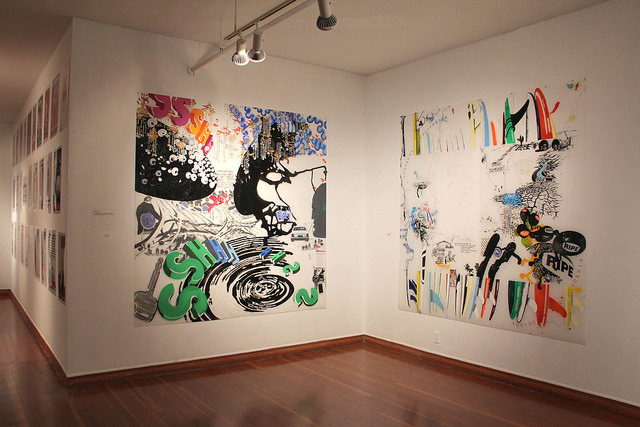 Art Forces moves from the local to the global, from the streets of San Francisco Bay Area to Olympia Washington. to refugee camps of Palestine and Lebanon. 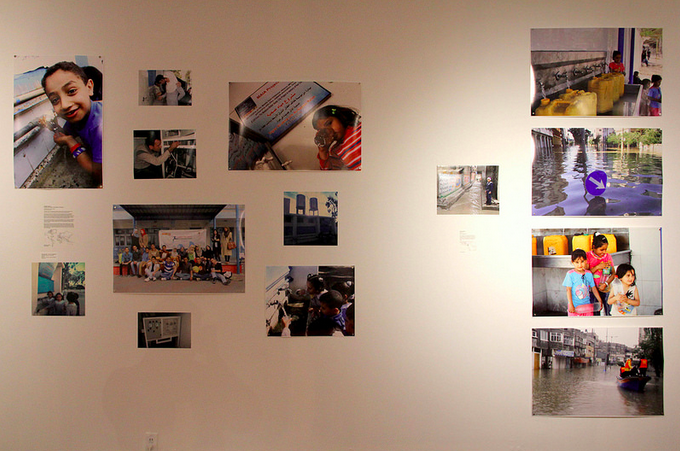 The projects make visible histories and relationships that have been obliterated and forgotten; making connections to national and global issues of social justice, borders, precarity, migrations and decolonization. 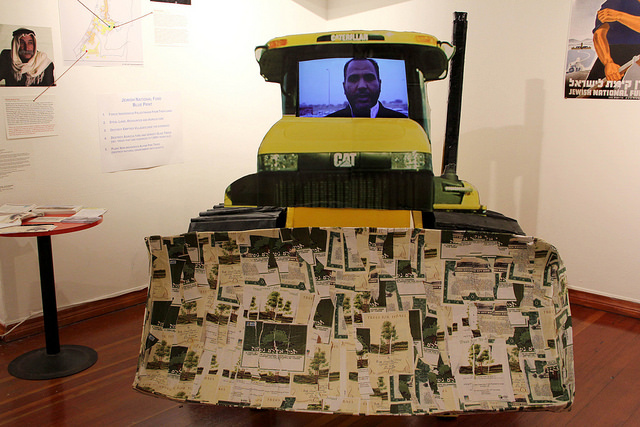 Art Forces works in the intersection of trauma, memory, creativity, resilience, and resistance, making visible the connections between struggles for social justice globally and histories that have been obliterated or forgotten. The project aims to engage the public on multiple levels to create potential spaces for critical thinking and action that advances progressive social change. Art Forces works across movements- using culture to create alliances as well as perceptual ‘ruptures’ or ‘disturbances’ wherein people have the opportunity to see connections that they had not seen before, and to imagine new possibilities. Art Forces works in partnership with a wide range of organizations, from mental health programs in Gaza, to environmental organizations, to organizations providing material aid, to those organizing non-violent resistance. Our ultimate goal is to use culture as an organizing tool to bring people together across movements. 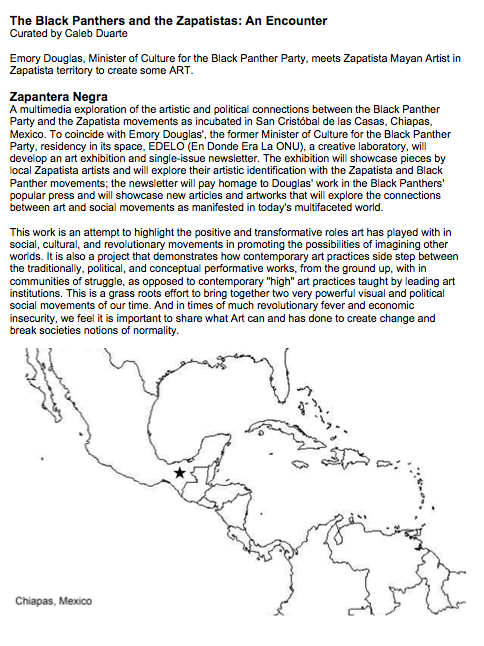 Our cultural products are then used by activists and organizers in their work to touch and move people. Image of Cheemah by Osprey Orielle Lake, The International Cheemah Monument Project Used with permission. 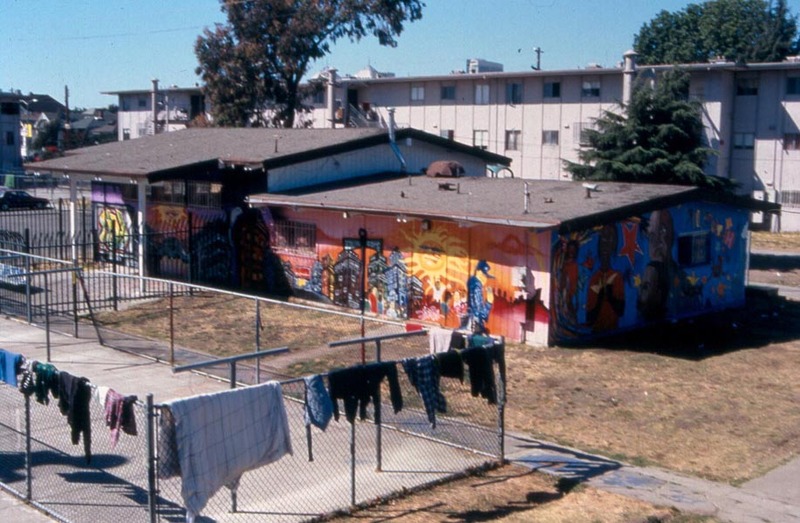 Chestnut Court, public housing on West Grand and Filbert, Oakland CA. 3260 23rd St - between Mission and Capp Streets in San Francisco. extension number OR download printable mural key here. 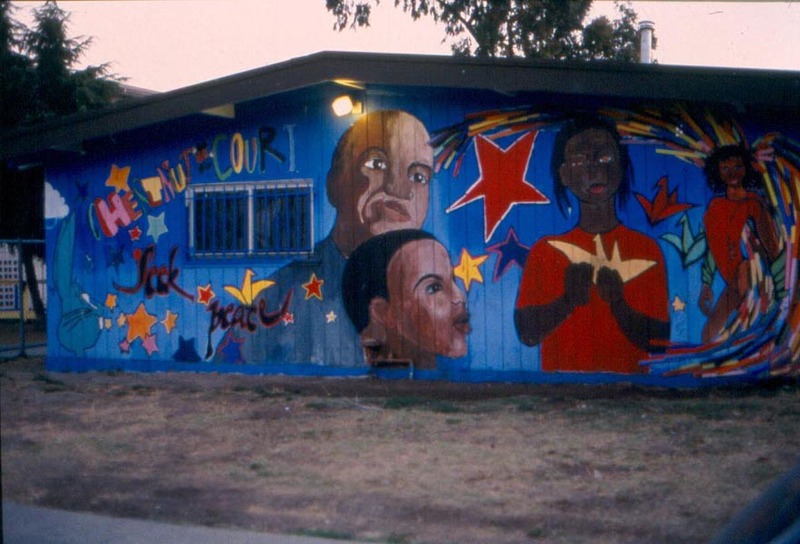 At Freedom Archive's Website you can interact with a photo of the mural above to learn more about each of the individuals portrayed and to hear an audio clip by or about them. Simply move your mouse over the desired individual and click. Or click on the name below. The Palestinian village of Silwan, East Jerusalem, struggles against unrelenting dispossession by the Israeli occupation. 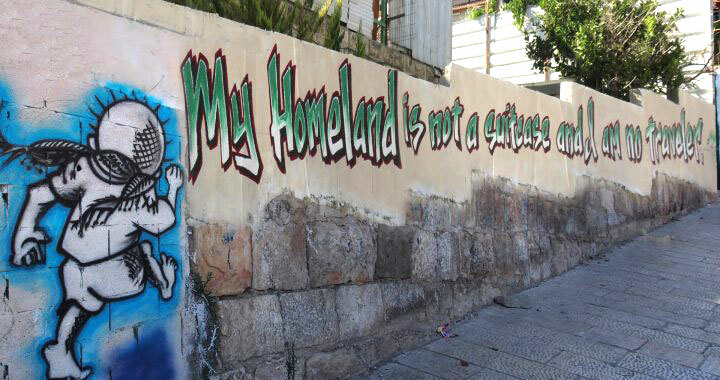 In the summer of 2015, the Wadi Hilweh Center of Silwan invited a group of international artists, Art Forces, to collaborate on murals that record and reinforce the enduring idea of ‘home’, samud (steadfast resistance) and joint struggle. Art. Activism. 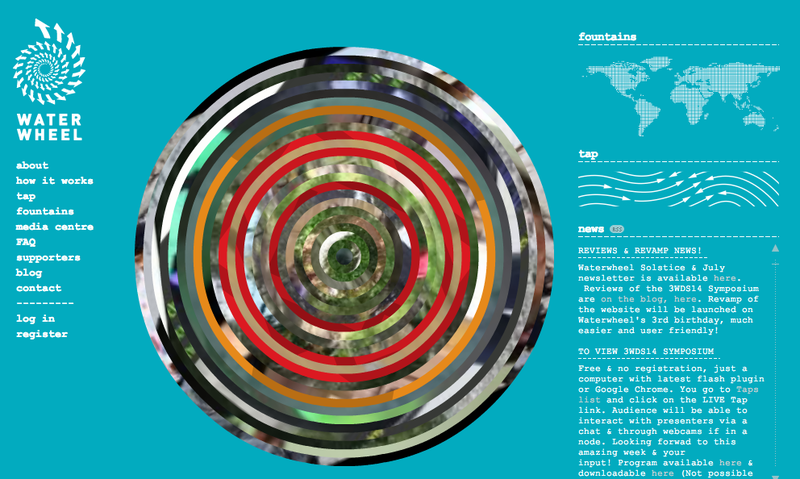 Mapping Environmental Justice. We live within multiple layers that are hidden from view; layers of history, stories, cultural movements and geography. 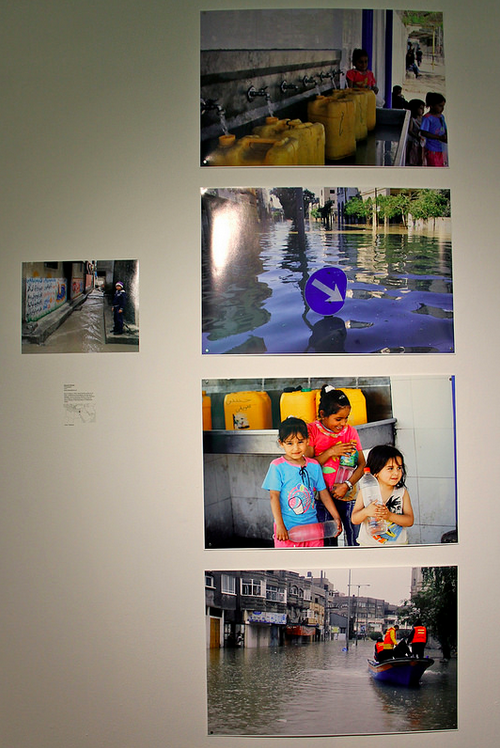 Using the stories, poetics and politics of water, “Resurfacing” interrogates global environmental systems and the ways in which they are culturally and socially produced, supported, resisted and transformed. 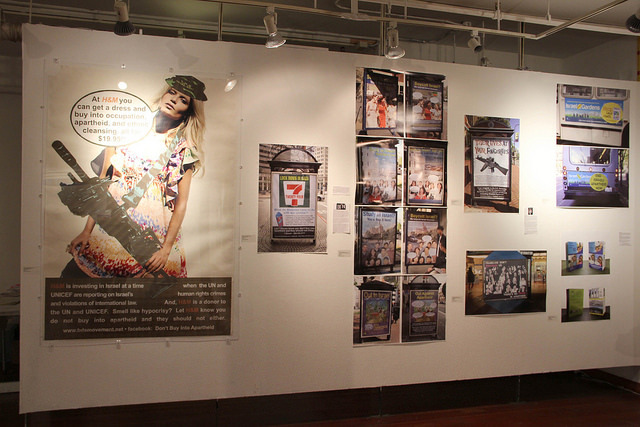 “Resurfacing” is envisioned as an inter-disciplinary interactive exhibit, project-space and conference. 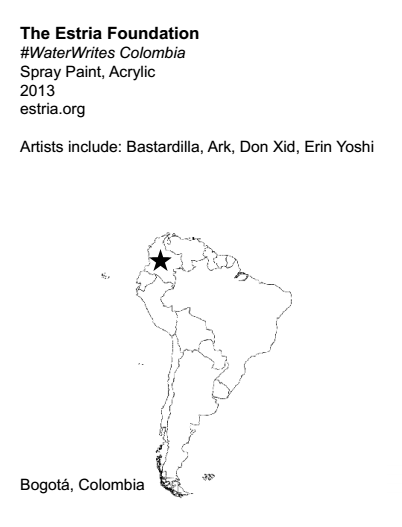 “Resurfacing” maps parallels and connections between seemingly distant locations and issues; and aims to create and support relationships and production that will develop beyond the length of the exhibit. 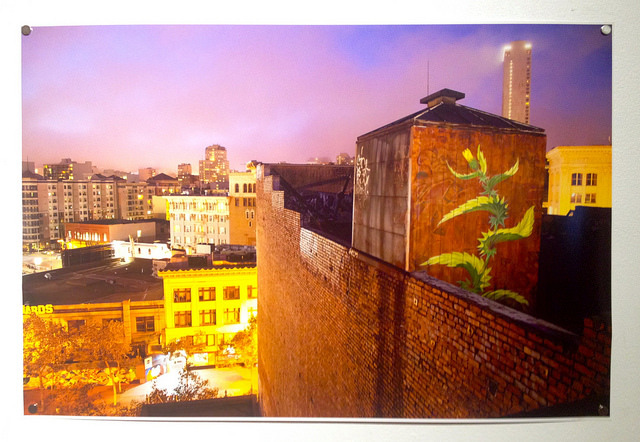 Susan Greene, San Francisco, 2014. 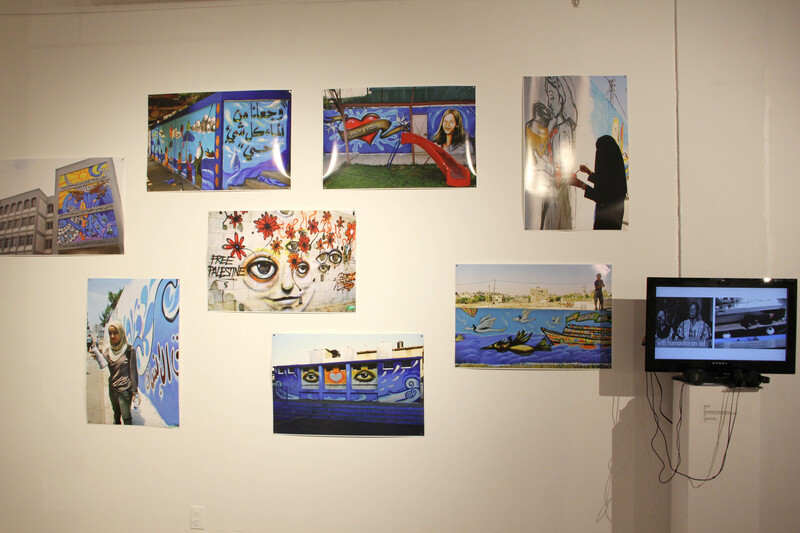 Images of nine collaborative international murals painted in Gaza with Art Forces/Break the Silence Media, Middle East Children’s Alliance and Estria Foundation #Water Writes (2011). 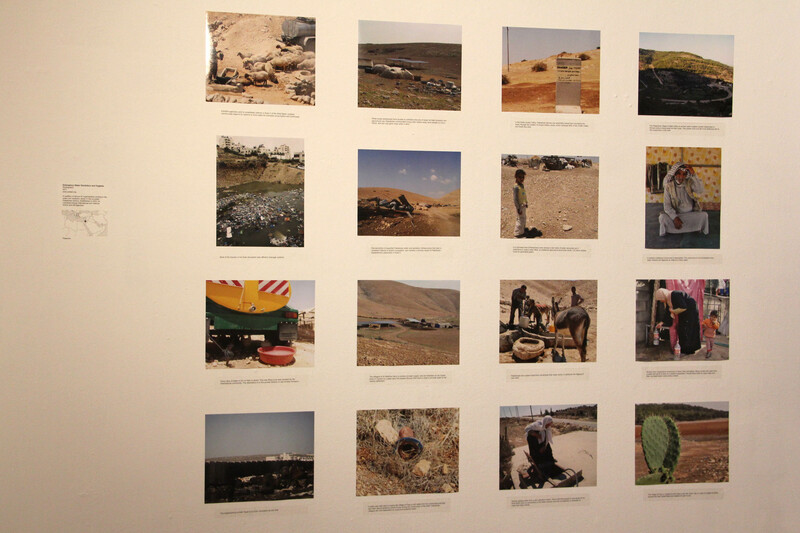 Accompanied by Videos providing stories and context (2011-2013). 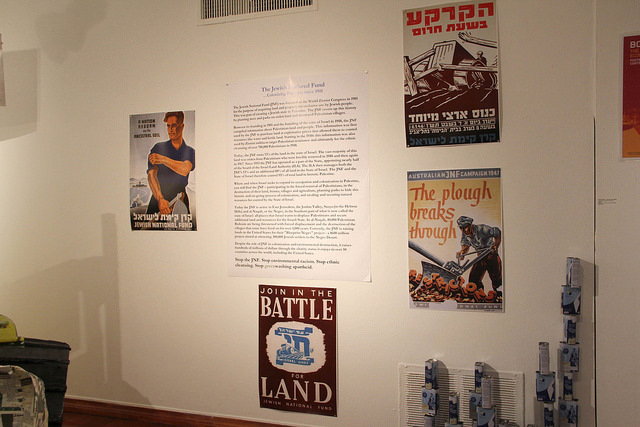 Traveling poster exhibition from Historical & Contemporary Boycott Movements highlighting diverse historical boycott movements from the 1950s to the present. Organized by The American Friends Service Committee (AFSC) and the Center for the Study of Political Graphics (CSPG). Series includes the Montgomery Bus Boycott, United Farm Workers’ boycott, divestment from South Africa to protest Apartheid, boycotts of corporations using sweatshops, the Palestinian call for Boycott, Divestment and Sanctions, and many others. 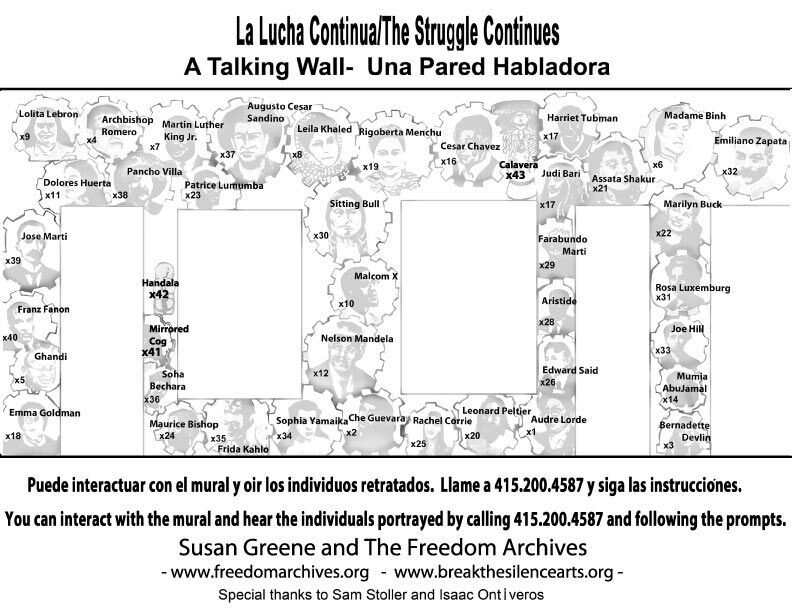 Audio elements from each of the movements represented include: Grape Boycott by US Farmworkers; Anti-Apartheid Boycott of South Africa; Palestinian Boycott, Divestment and Sanction movement. The goal of MECA’s Maia Project is to provide safe clean, drinking water for tens of thousands of Palestinian children by working in partnership with community organizations to build water purification and desalination units in schools and towns throughout the Gaza Strip.MECA has provided clean water to 16 large UN schools in Palestinian refugee camps and to 22 kindergartens in refugee camps, towns, and villages giving 34,000 children access to clean water. The Emergency Water, Sanitation and Hygiene group (EWASH) is a coordination body seeking to improve Water, Sanitation and Hygiene conditions in the occupied Palestinian territory (oPt) and minimize the adverse effect of the political situation on the Water, Sanitation and Hygiene sector. Up Against the Wall, 2002 – Present. Highlighting documentation of US/Mexico border, Israel’s wall in Palestine, and the structures used to cut off Spanish Melilla from Morocco. Investigations into California water politics and global oil industry. 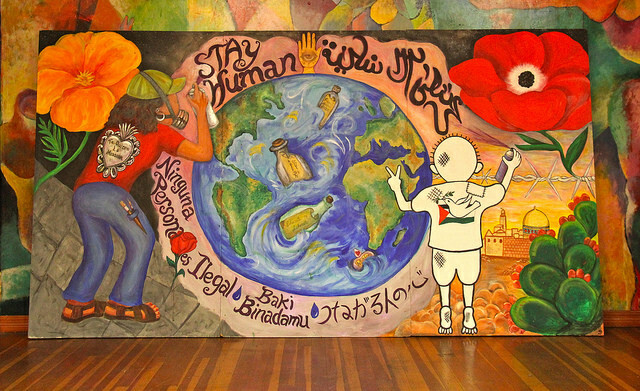 STAY HUMAN was created as part of the Movable Art Platform’s participation in the Precita Eyes Youth Arts Festival at La Raza Park in 2011. I designed and transferred the drawing to plywood panels. During the event many hands participated in the painting. Later, I completed it. 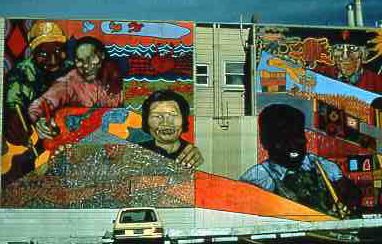 The theme is the murals of the Mission and their connection to the world. 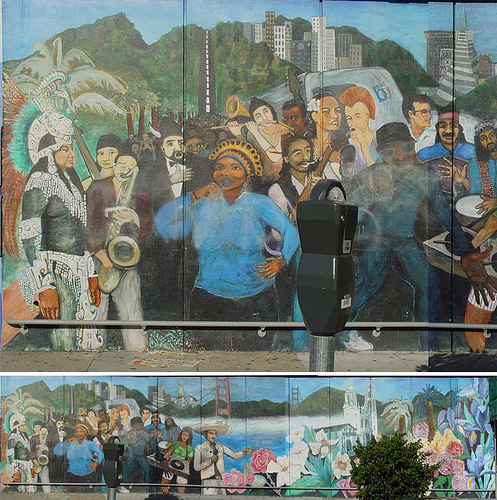 I lived a large part of my youth and adulthood in the Mission District – including growing up with and being a participant in the mural movement. 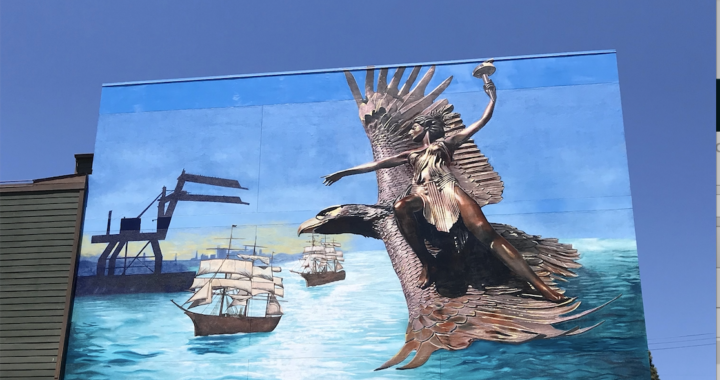 The female figure on the left represents the Mission and the passion of the mural artists. The title, “Stay Human” is in remembrance of Vittorio Arrigoni, an Italian volunteer with the International Solidarity Movement in Gaza. 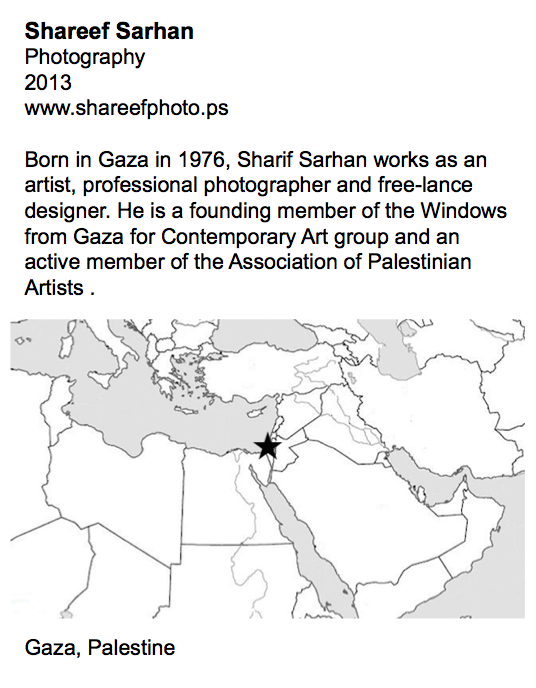 He wrote a book titled: GAZA, subtitled Stay Human. * All of his dispatches to the Italian press (written between bombing raids) ended with that plea, “Stay human”. He was murdered in 2011. 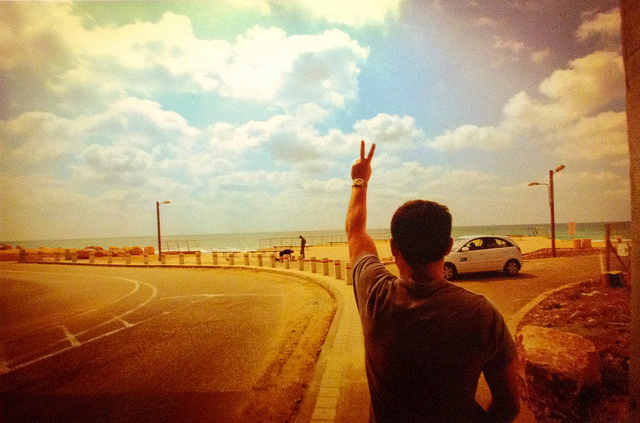 Eric’s First View of the Mediterranean, 2011. Juan Fuentes~Focusing on the figure or portrait as a means to tell a story, elaborating on the human condition. 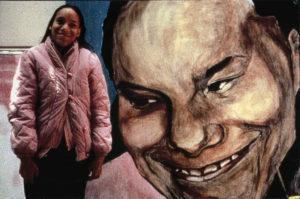 Juan has been a cultural activist/artist and printmaker for over 40 years. 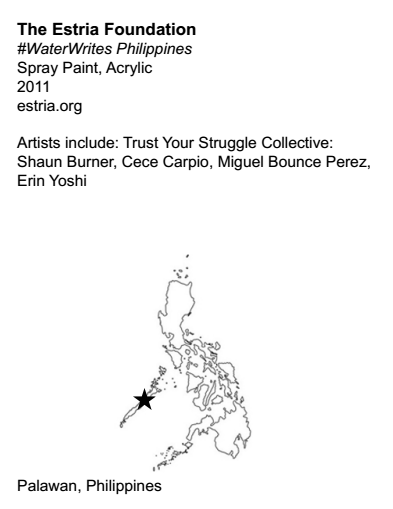 He has dedicated his art to supporting and being part of a global movement for social change. 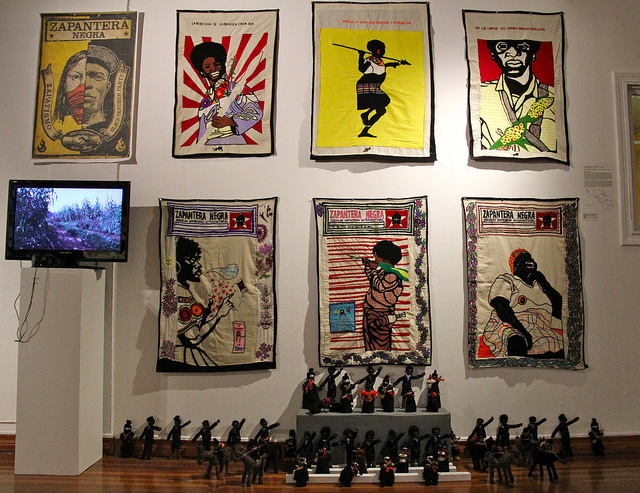 His works have addressed many issues as they relate to local communities of color, social justice, and international struggles for liberation. Juan was Director of Mission Grafica from 1999 to 2009. 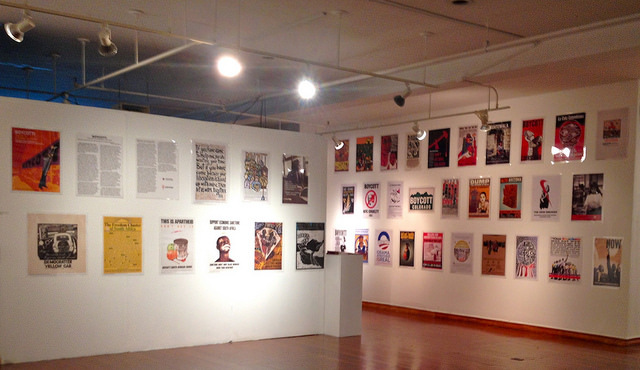 His posters are now part of the historical Chicano Poster Movement. 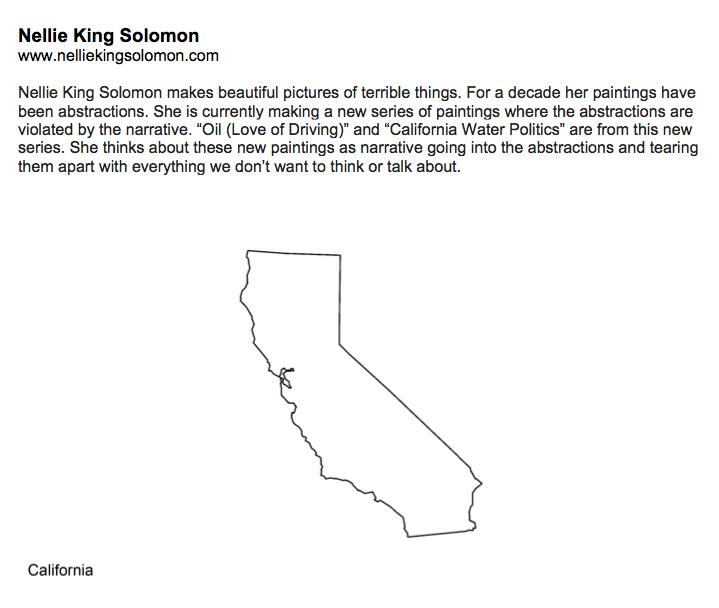 He has taught art in various Bay Area colleges and Universities and continues to create works with social content at his studio, Pajaro Editions, in the Bayview District of San Francisco. 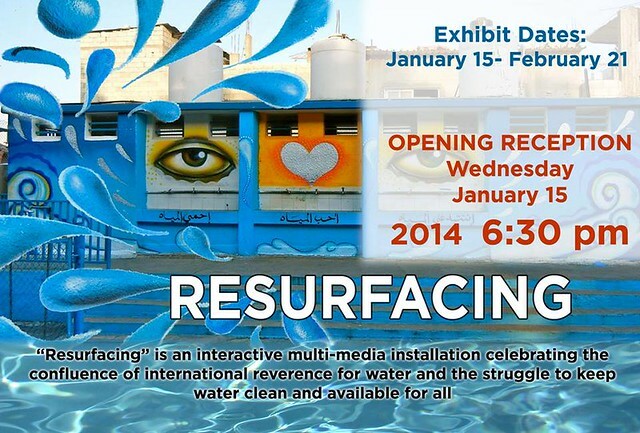 Susan Greene invited me, to participate in the “RESURFACING” exhibit, by bringing visual artists that addressed the struggle of the Palestinian people through their posters and prints. Bay Area poster makers have a sustained history of expressing solidarity with the struggles in the Middle East and Palestine in particular. The similarities of land struggles and displacements of Chicanos here in the United States have bonded our struggles. Therefore, it was a natural progression for me when I created my first Palestinian poster “Zionism is Racism”, for the Organization of Arab Students in the U.S. and Canada in 1977. I also created posters for the General Union of Palestinian Students in the Bay Area and the November 29th Committee for Palestine back in the 1980’s. 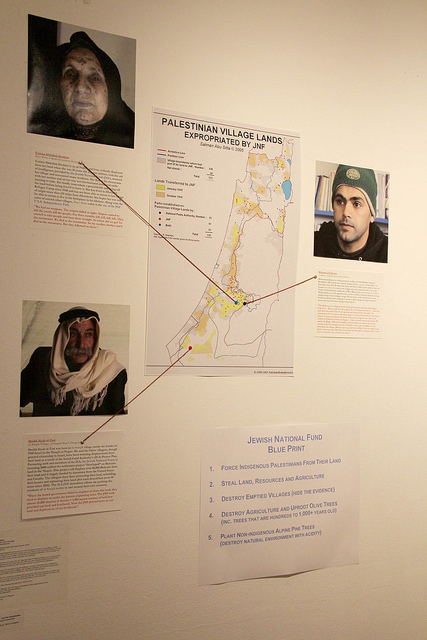 Today, we continue to visually express the unrealized struggle of an occupied Palestine. Malaquias Montoya and Jos Sances have been and continue to be mentors for other artists in the Bay Area, consistently supporting the Palestinian struggle through their work. 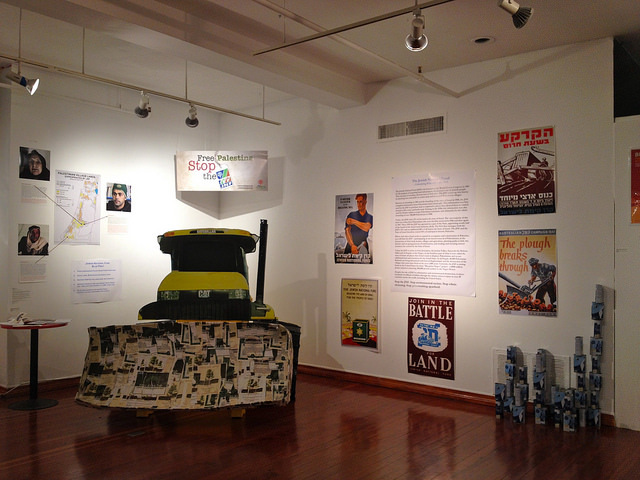 The new generation of artists, Jesus Barraza and Melanie Cervantes have helped to continue this legacy of poster makers. It is a great honor to be included in this collective of artists from the Bay Area, who have stood firm in their “Solidarity” with the Palestinian Struggle for Self Determination. I have also included a poster by internationalist Cuban artist, Gladys Acosta’s poster, “May 15th Day of Solidarity with the People of Palestine”. 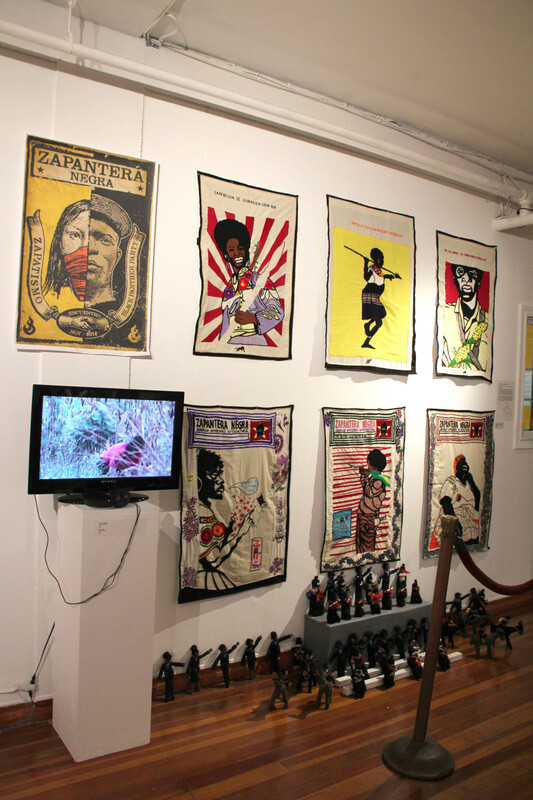 Cuban poster makers have been a symbol of inspiration for artists throughout the world. Dignidad Rebelde is a graphic arts collaboration between Oakland-based artist-activists Jesus Barraza and Melanie Cervantes. 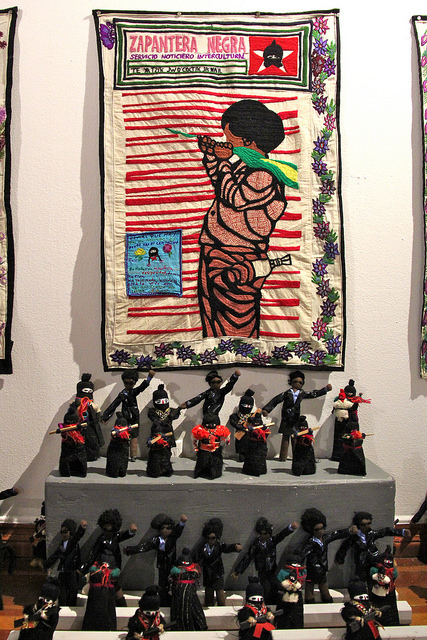 They believe that art can be an empowering reflection of community struggles, dreams and visions. Following principles of Xicanisma and Zapatismo, they create work that translates people’s stories into art that can be put back into the hands of the communities who inspire it. They recognize that the history of the majority of people worldwide is a history of colonialism, genocide, and exploitation. Jos is founder and the art director of Alliance Graphics. Since its beginnings in 1989 it has grown into a successful, union screenprint and design shop. Over the years Jos has designed and printed thousands of posters and t-shirts for hundreds of progressive causes, while at the same time maintaining a steady output of art, which address issues and ideas, which concern him. 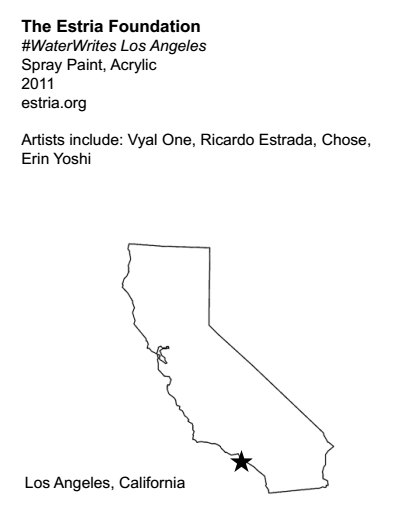 Before Alliance Graphics, he co-founded Mission Grafica at the Mission Cultural Center in 1980 and worked there until 1988. 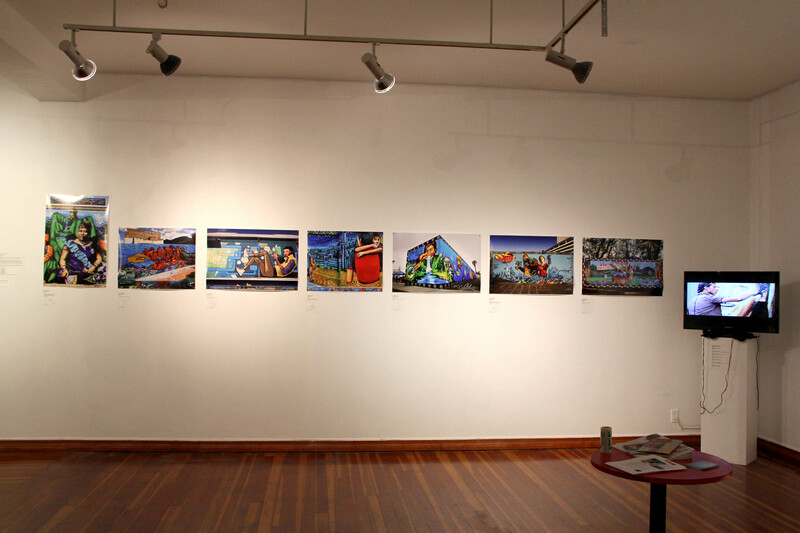 During the past 20 years Mural and Public Art has also been one of Jos’s passions. 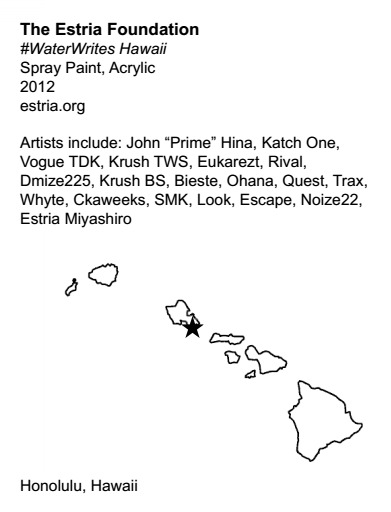 He has painted murals throughout the Bay Area. Jos is proudly a founding and lifelong member of the Great Tortilla Conspiracy. 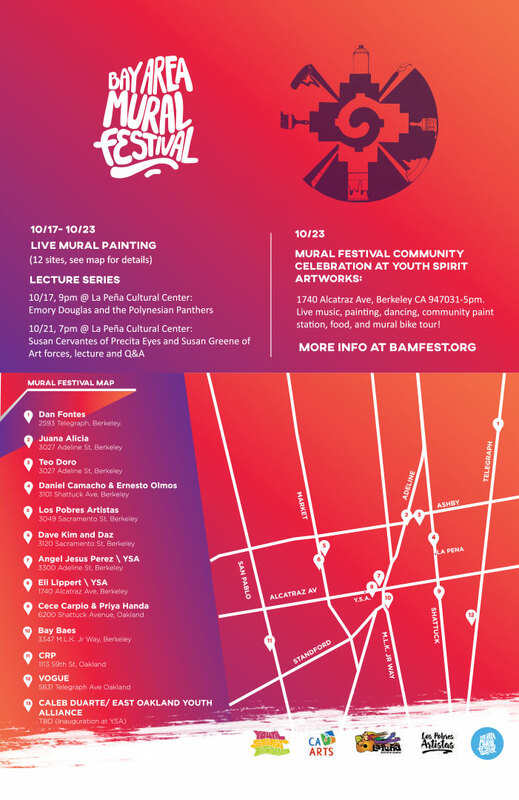 Malaquias is a long time Chicano poster maker, artist, muralist and teacher. He is a graduate of the University of Berkeley in 1969. He has lectured and taught at numerous colleges and universities in the San Francisco Bay Area. His own works include acrylic paintings, murals and drawings, but is primarily known for his silkscreen posters and prints. He was co-founder in 1968 of the Mexican-American Liberation Art Front, and influential artists’ collective working out of Berkeley. Malaquias is a professor of Chicano Studies at UC Davis. He has inspired artists, activists, and students for over 40 years. 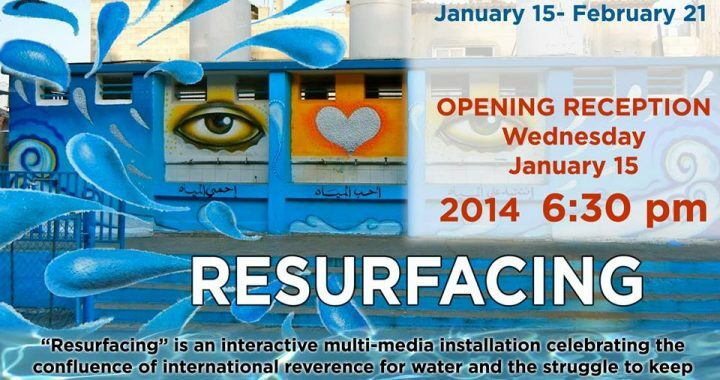 Wall size image of collaborative mural about water in refugee camp in Jordan. With video providing stories and context. Surveillance, policing, prison and corporate complicity: let’s take action! Flying Paper is the uplifting story of Palestinian children in the Gaza Strip on a quest to shatter the Guinness World Record for the most kites ever flown. It showcases the creative resilience of these children making and flying kites despite the difficult realities they face in their daily lives. The film has been co-produced with young Palestinians in Gaza trained by the filmmakers through a youth media program called Voices Beyond Walls. Through the perspective of children and young people comes a story of determination and artistic expression as the youth in the film work together to achieve a shared goal. While the record-breaking event is what drives the film’s narrative arc, it is the everyday stories of the young kite makers that will touch audiences through their humor and playful spirit. The film seeks to humanize the conflict through a touching cinematic rendering of the fascinating kite culture among children as a form of creative resistance in Gaza. 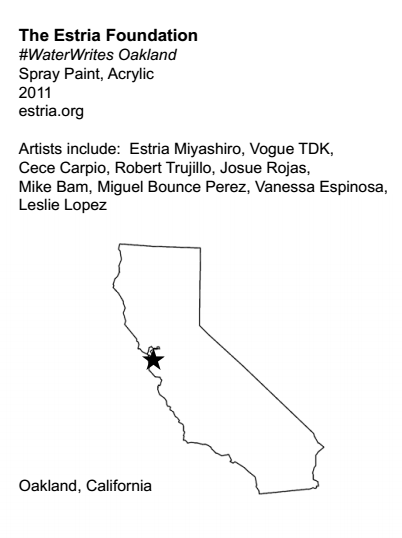 The Estria Foundation will be partnering with Friends of Sabeel North America, and ArtForces on a new collaborative mural project highlighting the Palestinian water crisis and international responses of solidarity on a large public wall in Uptown Oakland. 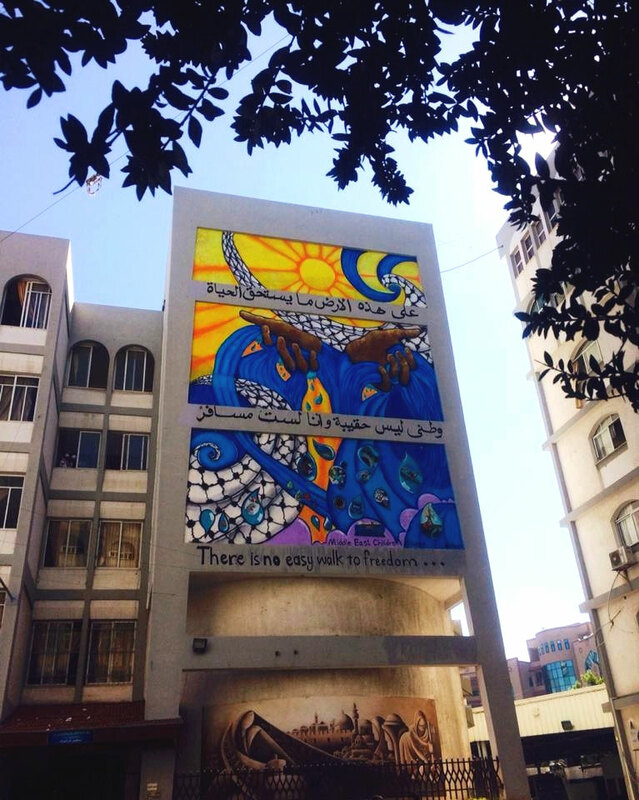 The mural will focus on water as the uniting theme across the mural and create a space for local community and artists to collaborate with a visiting artist from Palestine. We hope to develop imagery that will make these issues visible to the public of Oakland, and by ways of the internet, to the world. A unique one-day conference bringing together activists from all around the world involved in union organizing, Environmental protection and Palestine solidarity to confront the French multinational Veolia/ Transdev and build community resistance to privatization, union busting and corporate profiteering form human rights violation. Evening show and film screening. The Veolia Group is a French owned multi-national which plays a growing role in the world economy pushing privatization of water resources, transportation and other public services. 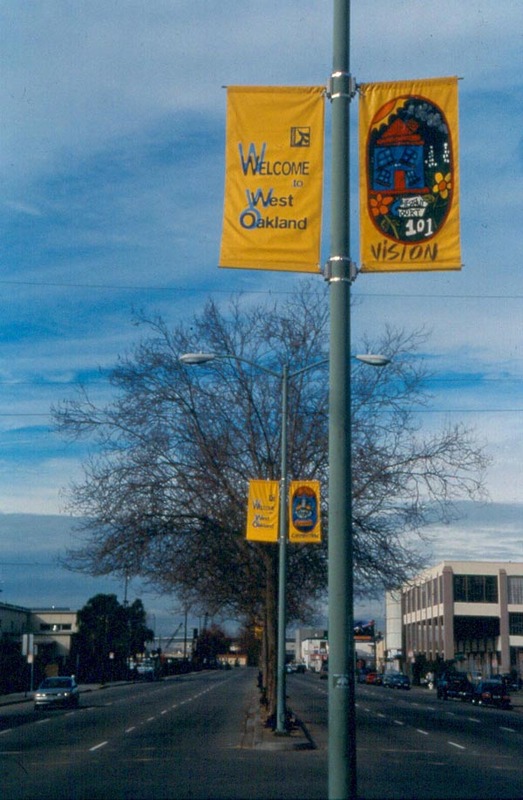 In the Bay Area Veolia has pushed for the privatization of water treatment in Richmond, California, which has led to union busting and environmental degradation. Dedicated to the memory of Nelson Mandela. A panel discussion will bring activists to address the power, controversy and effectiveness of divestment as a tool for economic activism in different movements: the movement against apartheid in South Africa, the struggle for Palestinian rights, the global movement to avert the climate crisis. Film clips and movement posters, followed by an open conversation. 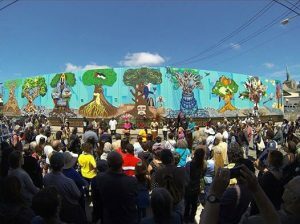 Closing Reception and Art Forces Report Back on recent projects in Refugee Camps in Lebanon and Maia Mural Brigade in Gaza, Plus Special guests. 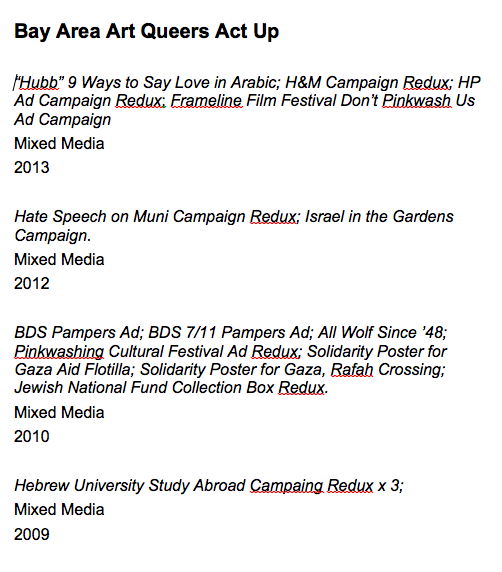 In 2010, UC Berkeley students made history with a campaign urging divestment from companies aiding Israeli occupation. Metier Productions, Directed: Anne Paxton. Ain Media, Gaza Strip, Palestine. Film about recent flooding in Gaza. Gallery Talks, Organized by Art Forces. Interactive evening event on Israel’s Worldwide Role : Organized by IJAN. Explorations and demonstrations of alternative ways to desalinate and purify water for drinking. 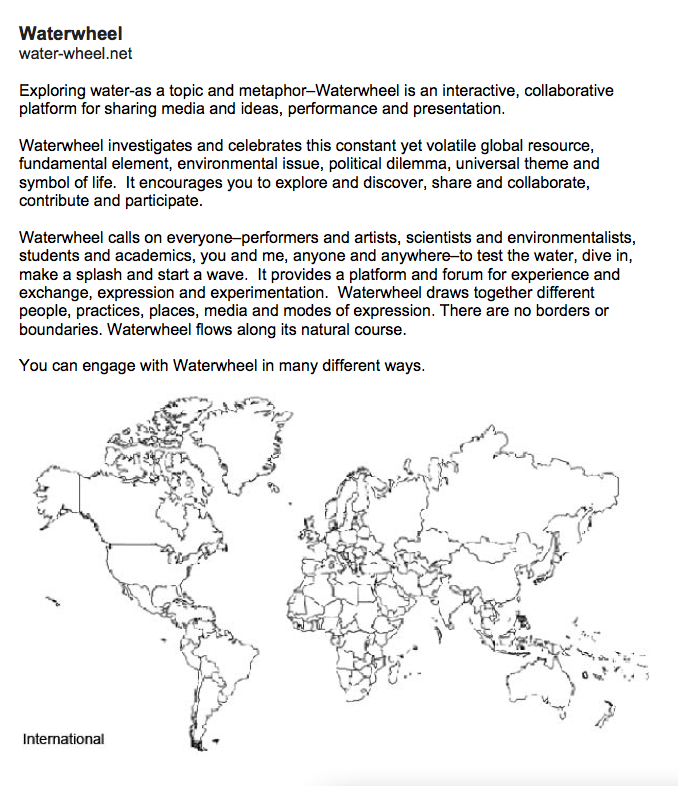 Education regarding resources, in particular water. 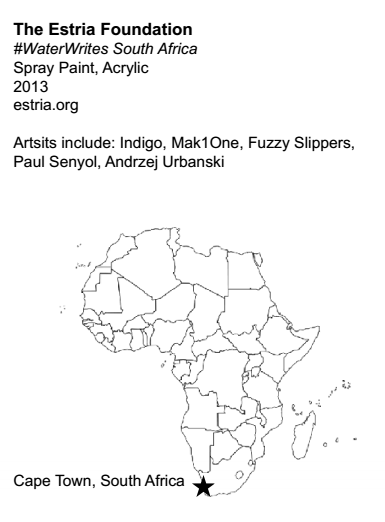 Mapping Environmental (In) Justice is Art Forces’ ongoing investigation into the global dynamics of precarity, societal instability and violence, environmental destruction and creativity. Maia Mural Brigade is a series of community mural projects located in refugee camps and towns in the Gaza Strip, Palestine. 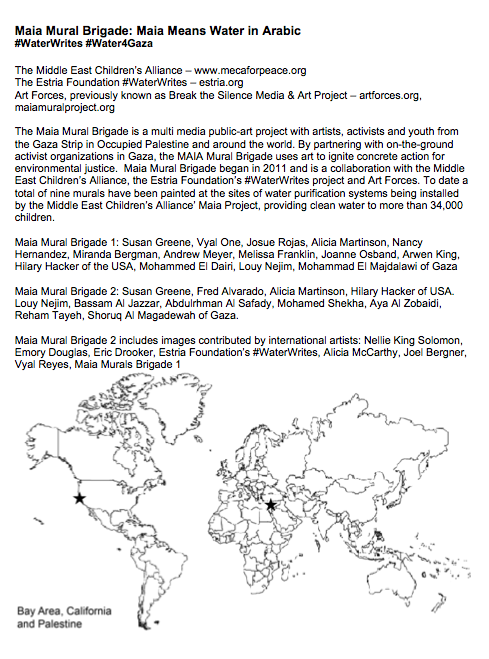 Maia Mural Brigade is a collaboration between Art Forces and the Middle East Children’s Alliance (MECA) and in 2011 with #WaterWrites project of the Estria Foundation. 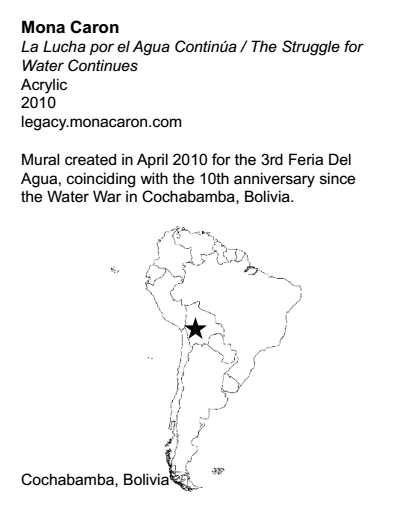 The murals are located at the sites of water purification and desalination systems installed with grassroots funding by MECA. To date 52 systems are providing clean water to more than 57,000 children and their families. 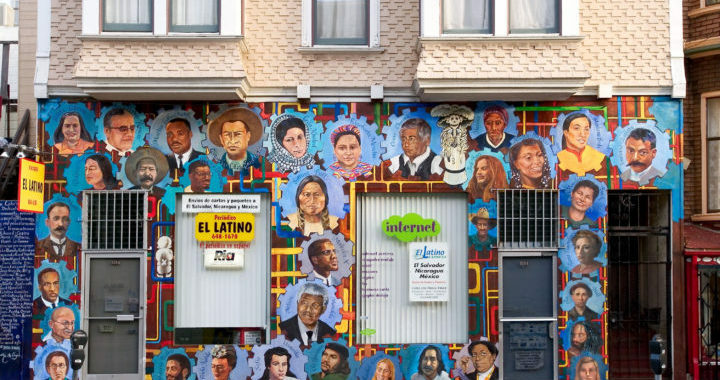 Art Forces, previously Break the Silence Media & Art Project (BTS/MAP) uses community public art and technology, including murals, websites, social and new media, to create spaces for critical thinking and action. 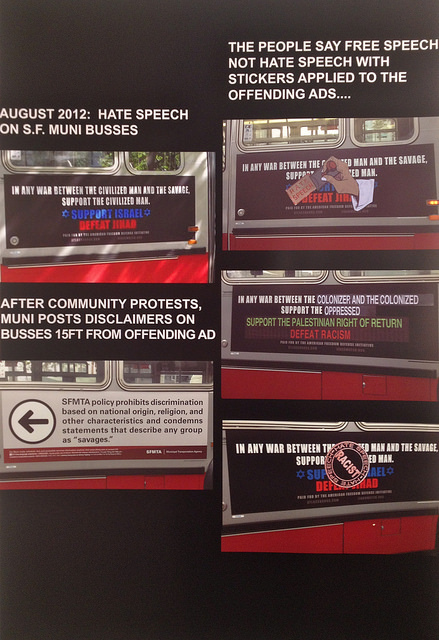 BTS/MAP moves from the local to the global, from the streets of San Francisco to refugee camps of Palestine. 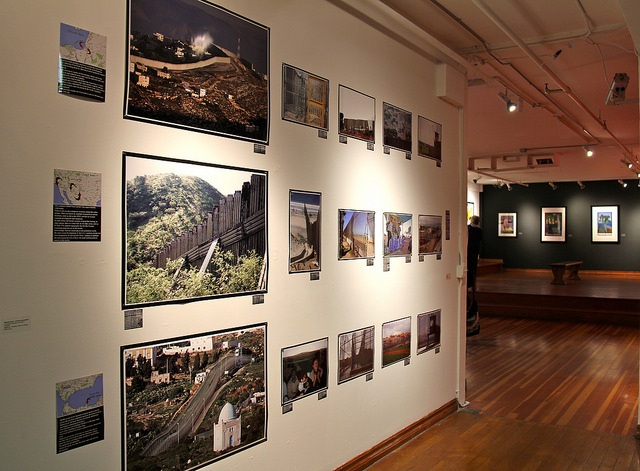 The projects make visible histories and relationships that have been obliterated and forgotten; making connections to national and global issues of social justice, borders, precarity, migrations and decolonization. Ziad Abbas,associate director of MECA will discuss MAIA project. There is a growing water crisis in Palestine that affects agriculture, industry, and the health of virtually every adult and child. In the Gaza Strip, poor sanitation and over-extraction have polluted the limited water supply. 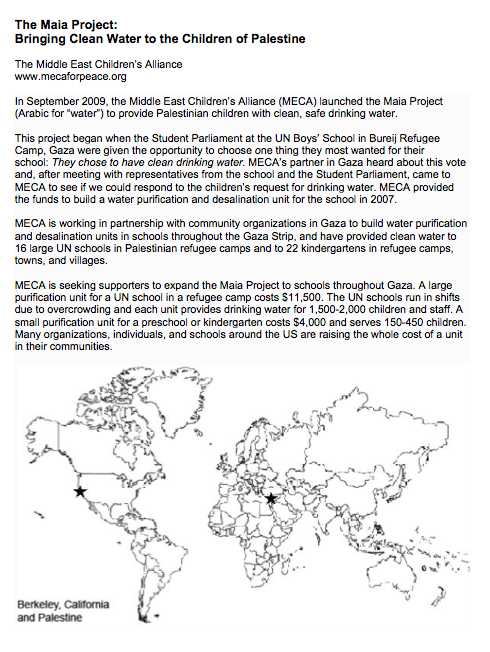 In September 2009, the Middle East Children’s Alliance (MECA) launched the Maia Project (Arabic for “water”) to provide Palestinian children with clean, safe drinking water. MECA is working in partnership with community organizations in Gaza to build water purification and desalination units in schools throughout the Gaza Strip.We have provided clean water to 26 large UN schools in Palestinian refugee camps and to 26 kindergartens in refugee camps, towns, and villages. 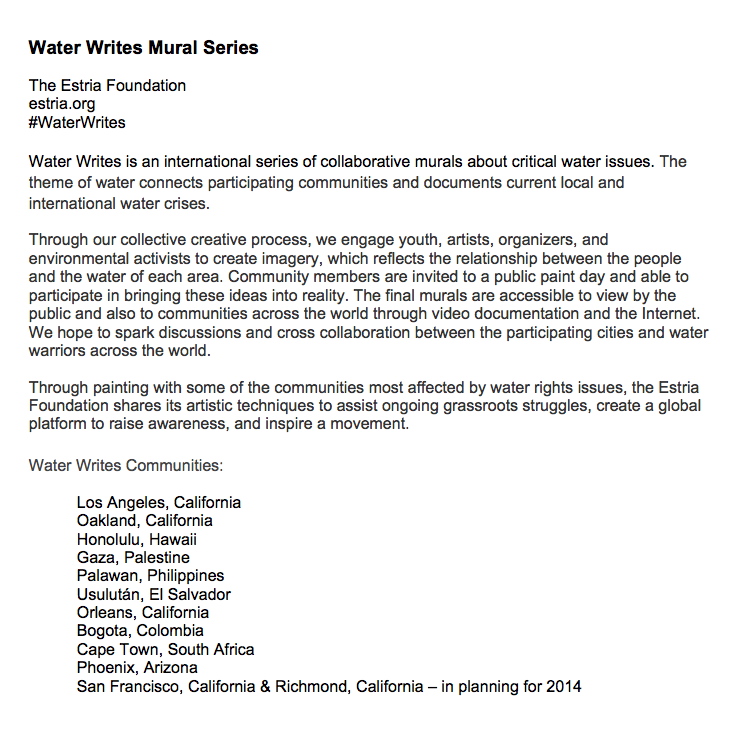 #WaterWrites Water Writes, a project of Estria Foundation, is an international series of collaborative murals about critical water issues. The mural we focus on for this event is located along the Klamath River, where the largest dam removal project ever is in motion after an advocacy campaign lead by local native tribes and environmentalists. 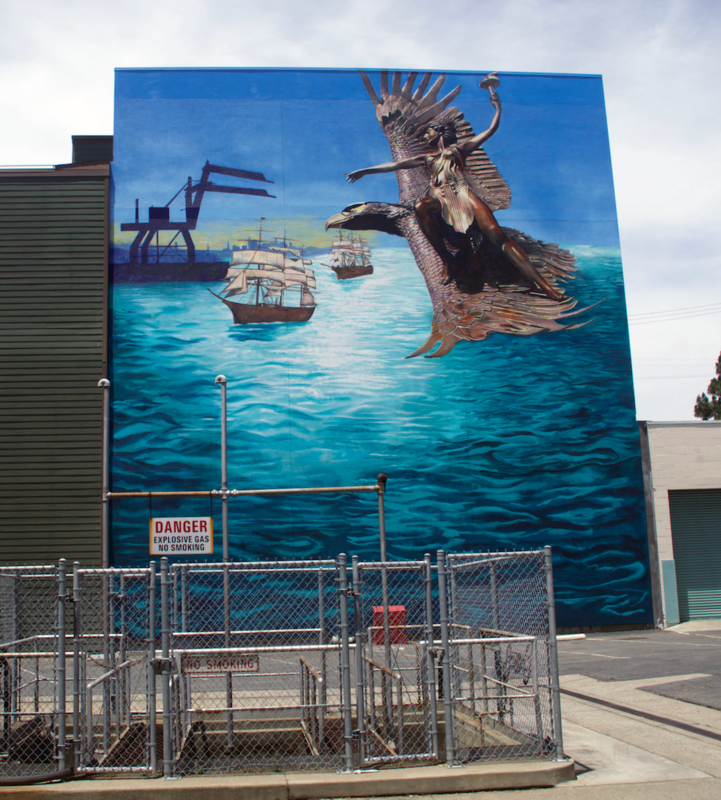 The mural portrays the Northern California Native people’s stomp dances that bring balance to the world. The dancer’s movements are breaking down the cement of the dams that block the Klamath River and prevent the salmon from swimming upstream to spawn. Watch a video about the project here. 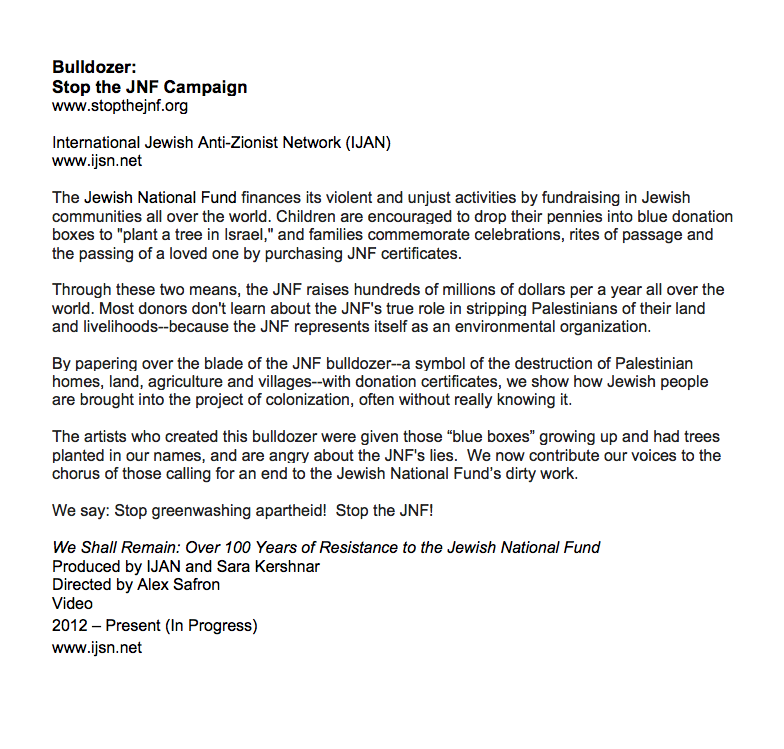 Stop the Jewish National Fund Campaign “Stop the JNF” is an international campaign aimed at ending the role of the Jewish National Fund (Keren Kayemet LeIsrael) (JNF-KKL) in: 1.) the destruction of the natural environment in Palestine and Israel; 2.) the on-going displacement of indigenous Palestinians from their land; 3. ) the theft of their property; 4.) the funding of historic and present day colonies. Both omnipresent and hidden, systems give structure to our everyday lives. Throughout Spring 2014, Intersection’s multi-disciplinary program explores these various mechanisms of social order at work. Intersection engages communities from the Bay Area to expand our understanding of systems — systems of economy, systems of tradition, and systems of oppression, among others — and our voice to effect change within them. The artists-in-residence in Systems offer economic, historical, political and aesthetic regimes as subjects for discussion. The series boasts a wide array of new work by artists reflecting on how we negotiate existence within systems that structure the world around us. 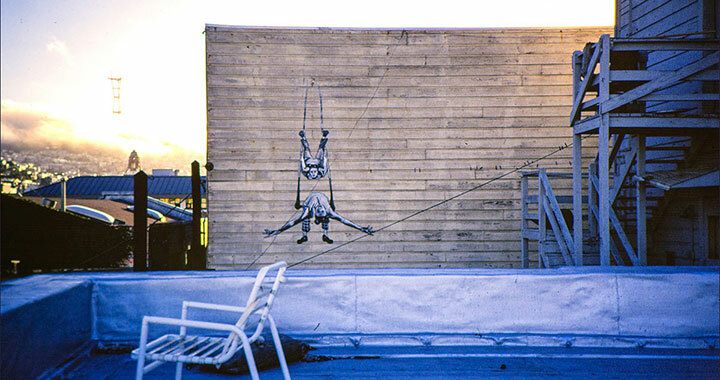 Bending Over Backwards (BOB) is a multi-site and multi-media permanent installation consisting of 2 dimensional murals of trapeze artists that each have an audio component and that are linked by audio/visual walking tours between the sites that reveal social, historical, political and environmental histories.Trapeze artists (painted on wood cut-outs and attached to the wall) are pictured in two neighborhoods of San Francisco, the Mission and SOMA, in an electrifying peak moment of their craft, embodying a mixture of whimsy, pathos and a sense of extraordinary possibility in their gravity-defying feat. Bending Over Backwards explores the high wire act that thriving in today’s world can be, providing visual and audio metaphors for tenacious, exhilarating and daring flights made in the attempt to realize one’s dreams. The trapeze artists’ success is possible only with great discipline, communication, strength, teamwork, vision and humor; echoing some of the skills necessary for a viable life in late stage capitalism of the twenty first century. For example: there have been several installations of BOB which have not survived the onslaught of gentrification. However, after a set of figures has been ‘disappeared’ another set of figures soon emerges. The elements of time, history, memory and tenacity are embodied in these appearances and disappearances. 16th Street between Mission and Valencia, 2010. Audio program # 415.325.4774. 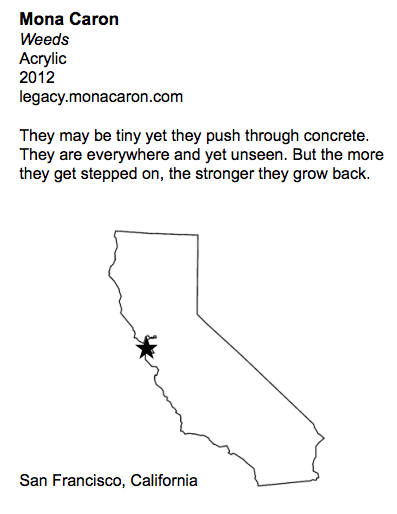 Features a poem by the late Marilyn Buck and music by John Santos. Community members adding their experiences and memories to the map.